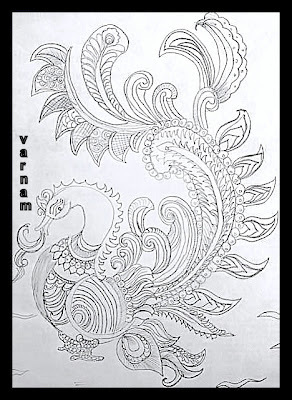 My next post is a pencil drawing of kalamkari style Swan.It is full of intricate line work which enhance the beauty of swan and makes the drawing more attractive.Drawing the outline with small division is a major source here,other thing is just filling the divisions with small lines with our creative imagination.I enjoyed working this swan. 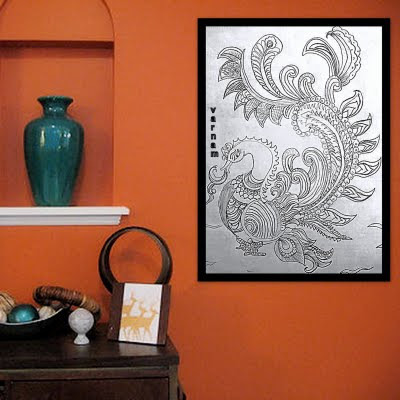 I too love kalamkari designs for the intricate works and the beauty. I remember having a calendar of kalamkari works but it had some colours here and there. But i was too young to know its value. Liked the swan very much. Thanx Mira.I did this work in leisure in small notepaper ,but the outcome was good.so kept for rememberence.Planning to do one with colours .will post after completion. this is very neat and sophosticated. so simple and yet so complex. hats off!!!!! Varnam ,as the name suggest,this blog focus on colour in everything . It comes to decorating interior spaces,adding colours to canvas,colors to fabric,attire . The possibilities are endless. Which colors should I choose? What theme should I go with? What look do I want to achieve? Aiming to provide you with a wide variety of resources making decorating,painting,enjoyable and fun…with a hope to inspire you. I'm shobana ramanan from india ,simple...funloving....cheerful.....person.i'm a good admirer.presently dreaming what to create next?. Relief Painting Classes Available All Over The World. T/c Apply!! Style Chronicles of two Silver Fiends!